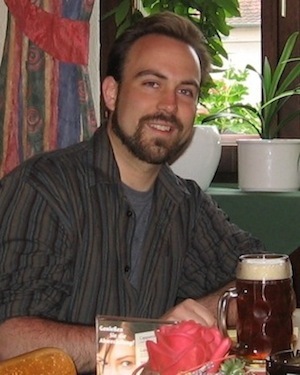 Martin Thibault is from Montreal but has traveled the world in search of Good Beer. He submitted this report many years ago (so many I am embarrased) and it sat on the virtual shelf gathering virtual dust. When planning the move to a new server I was poking around in the dusty recesses and stumbled upon this trip report, which I realized I had never put up on the site. Martin has graciously let me post it, even though parts of it are out of date -- sadly, old breweries are closing monthly and some mentioned here are no more. Bamberg and Franconia had been calling me for too long now. The promise of hundreds of countryside breweries all huddled next to each other in villages and towns barely unspoilt, and of countless lagers spawned from no specific stylings, but rather centuries of knowledge and tradition had made me study the region extensively in order to know where to go, at what time, and what products to seek. The only thing to do now was to actually get there. And it is only once I was sitting in Schlenkerla’s Dominikaner Abbey room, with its beams darkened by ox blood, intricate carvings in lamp fixtures, and statuettes bulging out of the arched walls, that it sank in. 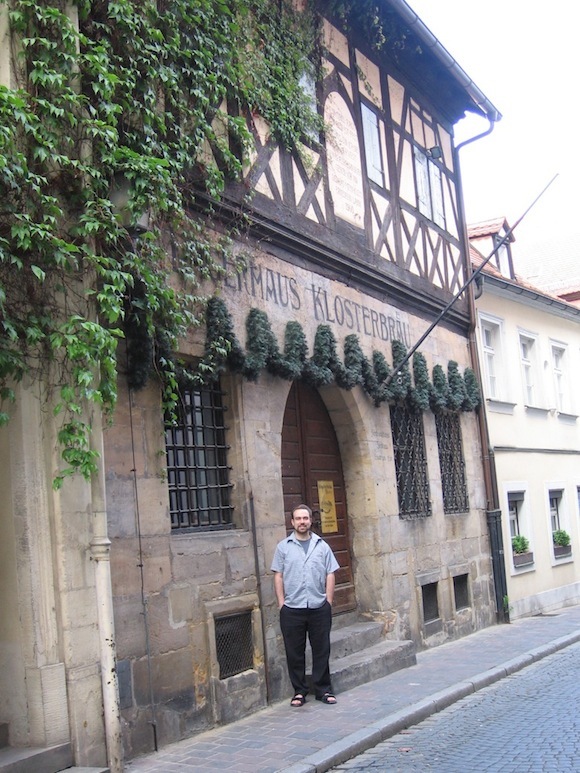 I was in Bamberg! Finally! A pint of Schlenkerla Märzen vom Fäss (“from the tap”) in front of me, intensely smoky, lingering, coating, yet so drinkable. 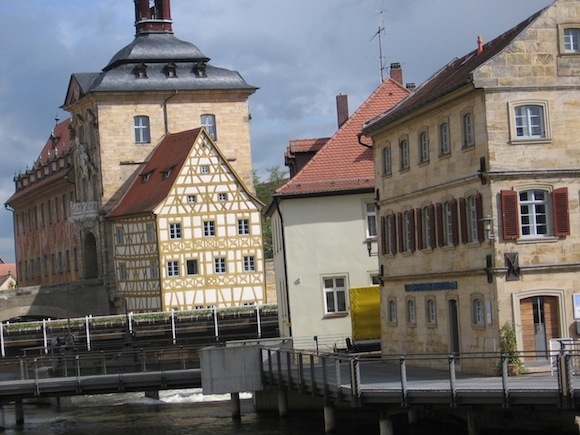 Perhaps Bamberg’s most prominent gambrinal symbol. My wife Marie and I’s blunt and efficient waitress was contributing to the stern but serene atmosphere, not a word of English spoken, not even written on the menus. We didn’t ask for it either. The Bamberger Zwiebel in rauchbier sauce was tasty and filling, just as we had expected. I could not have imagined a better baptism to Franconia’s tasty wonders. I pinched myself. I was still there! After a little nap to kill the jetlag, we headed up the Stephansberg hill, right next to our rented apartment. All the way up, past Spezial Keller, and Mahr’s Keller, sits Wilde Rose Keller, a large wooded area with hundreds of picnic tables. The weather was perfect for us to seek shade, and what better place to hide from the beaming sunshine than a bierkeller! 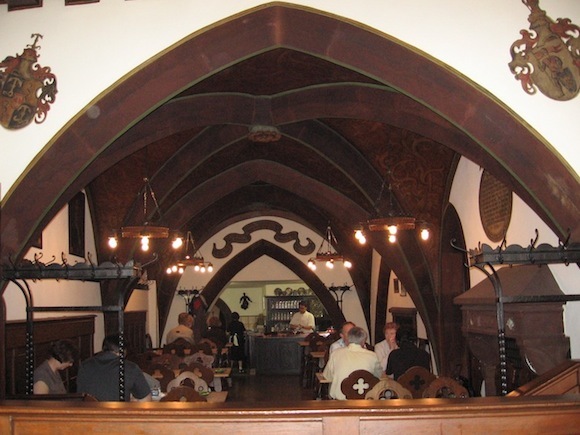 This specific keller was particularly interesting because they serve 2 of their own beers, purportedly brewed by Maisel, one of Bamberg’s 10 breweries; a kellerbier and a pils. You have to buy your beers at a booth, and leave a 3-euro deposit for your krug (“stein”), since there is no table service. I smiled broadly as I walked back to our table, krugs dripping with foam and beer. The sound of cackling kids in the adjoining playground, and the weightless floating of tree flowers were setting the stage for a most joyful moment. 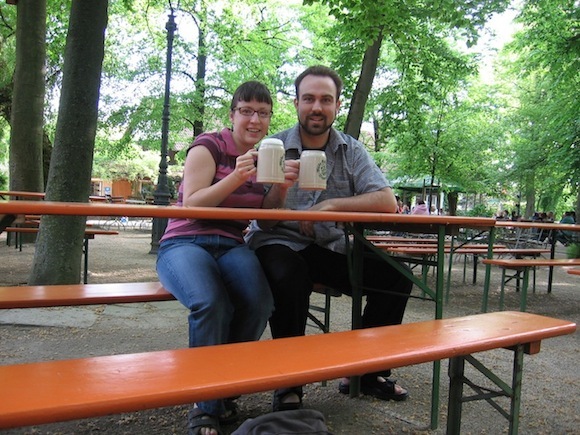 The Kellerbier was a veritable liquefied nature reserve. Powerful grassy, citrusy, earthy hops creating a flowery aura atop the krug, leading to a verbose grassy hops flavor and hay-like malts. The smooth, natural carbonation served the beer’s freshness valiantly. Wild yet restrained, flavorful yet easily drinkable, a marvelous concoction. Tiny bugs were even crawling up my krug, attracted surely by this mirror of surrounding nature. The Pils was very talented as well, boasting a citrusy haystack following up into a menthol hop aftertaste. Straightforward bursting with flavor, this was as quenching as it could get. A lilac perfume reached us from a neighbour’s garden. I kept smelling my empty krug of Kellerbier. This was my Confirmation. Ritual pinching done, and the voyage could apparently continue. Walking back down the Stephansberg, we embrace the quietness of Bamberg. There are probably more bicycles than cars around town, and more ducks and whistling birds than tooting car horns. The aviary melodies lead us across town to the Bamberger Weissbierhaus, a tap room for Brauerei Maisel (not the Bayreuth Maisel, mind you). Since they are supposed to be the brewers of the fabulous Wilde Rose products, I wanted to compare their namesake Kellerbier, as the Wilde Rose’s was still fresh on my palate and mind. The translucent amber of my pint was the first sign of difference with the Wilde Rose Kellerbier, which was healthily unfiltered. Hay was prominent in the nose, and caramel maltiness more important than WR’s. Carbonation was spritzy, much more effervescent than the quite possibly naturally carbonated Wilde Rose.The wooden, herbal hop bitterness was pleasant, but quite milder than its compatriot up the hill. A decent quaffer, but a sterilized version of the Wilde Rose, if there is such a link to be made at all between the 2 beers. Believe it or not, our stomachs were growling for more food! Our jetlagged brains were increasingly calling for rest too, so this late dinner would be our last tastebud festivity for the day. Just in case we’d be too tired to walk back to our apartment, we settled on Klosterbräu, the city’s oldest, still-standing brewery, a few steps from our place. The servers welcomed us with a smile, but none met the width of my own smile when I noticed on the board that they had some Maibock Hell left on tap. Excellent! A pint of that, and a pint of Schwärzla for dark-beer-loving Marie, and we were set to order dinner. Honeyed maltiness and light alcohol first surged from my pint of Maibock, an aroma not unlike many Czech sv?tlé speciálnís we had encountered less than a year ago. Dry hay and wooden hops soon built up to supercede the sweetish approach, and we were in a whole new territory. Strong herbal hop bitterness benefited from a peppery build-up, playing alongside apple and pear fruitiness. Complex, muscular, yet quite easy to drink, nothing less than what I was expecting. A great accompaniment to my gigantic bierhaxe (leg of pork), which was just a little too much for my stomach that day. Marie’s Schwärzla was laden with roasting raisins, delicate caramel sweetness, with a mild but building dark chocolate aftertaste. A simple but well-built schwarzbier, a competent companion to the sausages and sauerkraut she was having. By that point, I still didn’t know what to make of the 2 klöße I had in my plate, gooey balls of what-the-heck which felt like the evil hybrid concoction of gelatine and mashed potatoes. Luckily, my dreams that night were devoid of squiggling klöße. For good reason, we were making our first foray in the Franconian countryside tomorrow! Which number is highest 53 or 64?